Summary: The main entrance to the compound is through a vaulted passage under the bell tower. The lower part of the tower is probably the original construction built during the reign of Prince Alexander the Kind (1400-1432), but the upper part was added later. The vaulted passage is decorated with frescoes that seem to have been inspired by the popular novel Varlaam and Ioasaf. 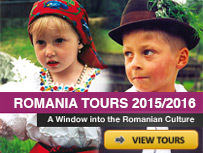 The frescoes are dated from the 15th and 16th centuries. 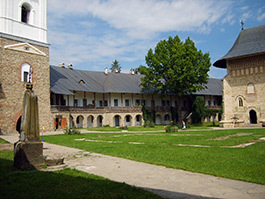 The Neamţ Monastery is first mentioned in a 14th century document, in which Petru I (1375-1391) donates villages and lands to the monastery. Nothing remains of the original buildings. It is not known what happened to the church that Petru I had built, but it is possible that an earthquake damaged it in 1471. 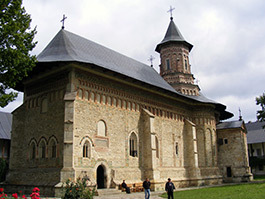 The monastic buildings were built and rebuilt several times during the centuries. The present constructions, which form a defensive wall around the church, were built during the 18th and 19th centuries. 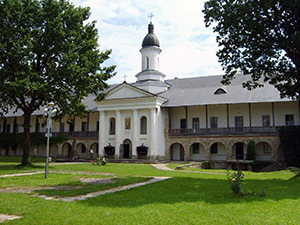 The imposing Church of the Ascension of the Saviour dominates the yard. 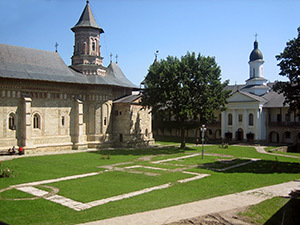 Stephen the Great decided to demolish the damaged church of Petru I, and to build a new one during the last decade of the 15th century. The stone inscription, written in Slavonic, is on the south façade, above the entrance. It states: “Our Lord Jesus Christ, receive this edifice built with Your help for the glory of Your holy and blessed ascension from earth to heaven, and You, our master, lay Your mercy upon us from now to eternity. 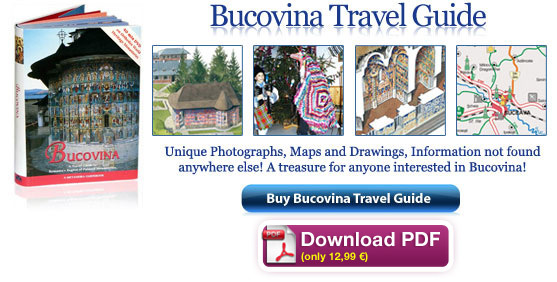 Prince Stephen wanted and started and built this edifice as a place of commemoration of himself and his wife Maria and his son Bogdan and his other sons, and completed it in the year 7005 (1497), the 41st year of his reign, the 14th day of November”. 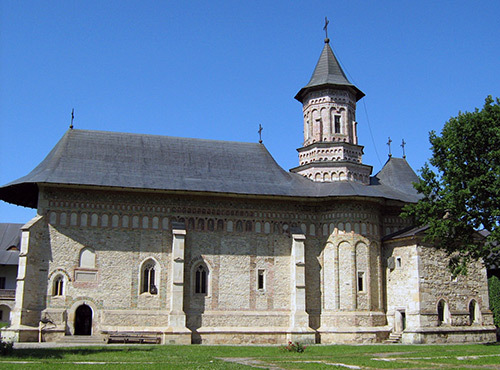 The church of the Neamt Monastery.